Cambridge students enjoy a local scavenger hunt activity. Cambridge Students after completing a scavenger hunt around La Jolla. 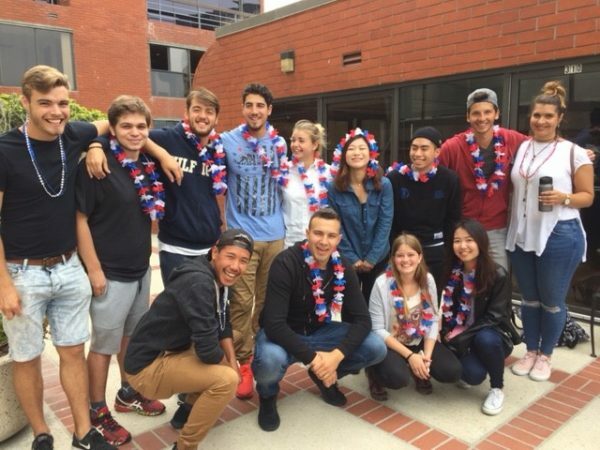 Cambridge students in Marilyn’s class took part in a scavenger hunt throughout the village of La Jolla last week. Some of the tasks included asking someone what their favorite restaurant is in downtown La Jolla are, taking their photos where students asked the questions and then finding the restaurant and taking a photo in front of it. Other photos included taking a photo in front of the La Jolla Public Library, finding the La Jolla Recreation Center and taking a group picture in front of the building. Students also had to find someone wearing plaid and asking a group member take a picture with them. They were also required to find and take a photo of someone doing a “Passive Grammar” activity and then write a passive sentence to show they understand the meaning. For example, “The street is being swept by a man. After writing a conditional question, students were required to ask someone on the street to answer the conditional question, take a photo with them and record their answer. The winners were selected based on best completion time and most correct answers. Congrats to Flurin and Rina and Philip, Claudia and Jin!